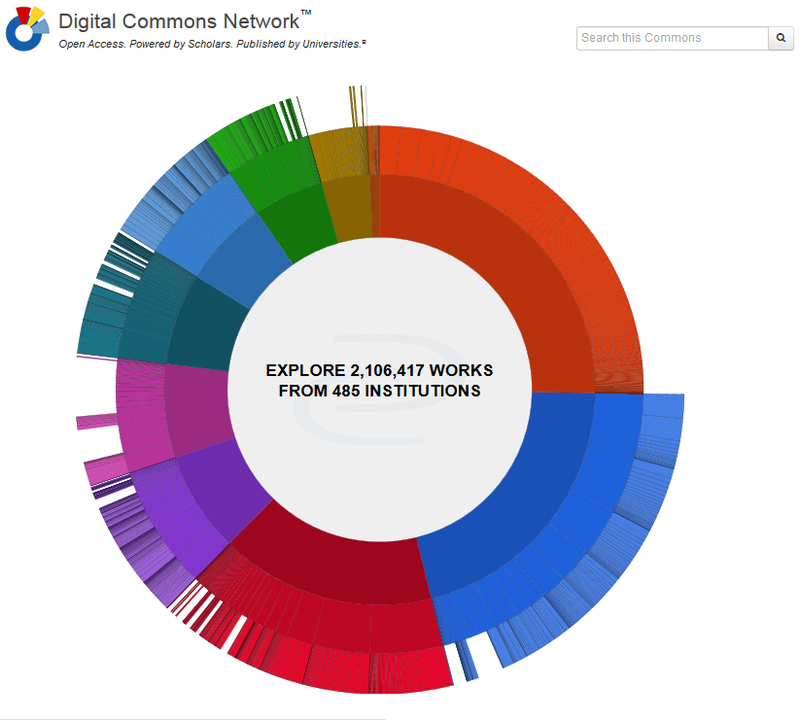 The Digital Commons Network (DCN) was launched three years ago with just over 500,000 works from 250 institutions. Today we are excited to announce that the DCN recently surpassed two million open access articles from over 450 institutions. This makes DCN the largest subject repository of open access scholarship available, nearly twice the size of arXiv and well over three times larger than SSRN. The two million items in the DCN have been downloaded 345 million times. All content in the Network is downloadable without a login, meets open standards (OAI), and is available for bulk download via participating institutions’ OAI feeds. Institutions control what is in their Digital Commons and SelectedWorks platforms and whether that content is included in the network. Built on a dynamic and intuitive graphical interface, the Digital Commons Network makes it simple and fun for readers to discover research related to their disciplines. Researchers can take advantage of the built-in networking tools to follow popular authors, institutions, and publications in their field. Since launching the Network we’ve heard a great deal of enthusiasm for the DCN as a whole as well as for the data available from the individual commons, including Law, Social and Behavioral Sciences, and Arts and Humanities. The Digital Commons Network is also a valuable research tool for non-academic researchers including the media, government agencies, industry, and K-12 educators and students. As we see this incredible resource grow, we want to hear your stories. How are you using the Digital Commons Network? Write us at outreach@bepress.com or share stories via twitter @bepress.